Golden Retrievers are not bred to be guard dogs, and considering the size of their hearts and their irrepressible joy in life, they are less likely to bite than to bark, less likely to bark than to lick a hand in greeting. In spite of their size, they think they are lap dogs, and in spite of being dogs, they think they are also human, and nearly every human they meet is judged to have the potential to be a boon companion who might, at many moment, cry, “Let’s go!” and lead them on a great adventure. Initially bred in Scotland in the 19th century as hunting dogs to retrieve fallen waterfowl, Golden Retrievers are both excellent huntsmen and ideal family pets. At the time, waterfowl hunting was very popular among Scotland’s elite and the need arose for a hunting dog capable of navigating both land and water to retrieve birds shot from great distances. Noted for their superior hunting and athletic prowess, Golden Retrievers proved to be so successful that they quickly spread all over the world, their soft mouths gentle enough to carry game. The Golden Retriever breed was officially recognized by the American Kennel Association in 1925, and shortly after became a popular pet, show dog, and obedience competitor. American Golden Retrievers are leaner than English Goldens and their eyes are slanted in comparison. Golden Retriever dogs remain one of the most popular breeds in America. Golden Retriever characteristics include being highly intelligent, patient, obedient, athletic, and possessing an instinctive love of water. Many of the traits that led to Goldens’ success in the hunting fields persist in the breed today. These traits, combined with their amiable temperament, make them eager learners who are easy to train. Golden Retrievers make great service dogs, effective for search and rescue and detecting drugs and explosives. They are employed as guide dogs for the blind, assistance dogs for those with disabilities and as therapy dogs. Their gentle, playful nature also makes them a perfect family pet, though they can be over exuberant and boisterous at times. Plenty of exercise will prevent destructive behaviors developing. If you can throw a ball, your Golden will retrieve – time and time again! They love to carry and retrieve items. 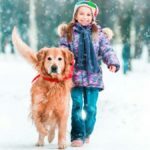 The typical Golden Retriever temperament is to be patient with children and friendly towards strangers and family members alike (making them a poor choice for a guard dog!). Requires at least 30-60 mins per day of hard aerobic exercise – usually 2 sessions per day. Goldens love to play outdoors. 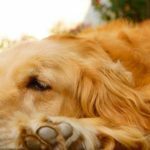 If you are looking to welcome a Golden into your home visit Golden Retriever dogs for sale and Golden Retriever adoption. 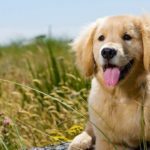 Researching Golden Retriever facts and information can help you decide if the Golden is the right dog for you.